Note that this article mainly approaches the topic of resolution from the perspective of photography, although the final comparison among software options also includes a digital illustration component. You’ll be seeing a lot of these two before long. In photography, resolution is the amount of detail in a photo. This is determined by factors such as focus precision, lens quality, and camera sensor pixel count. If you print your photo, other factors come into play as well – the size, display medium, and quality of the print, and so on. When photographers ask about increasing an image’s resolution, pixel count is typically what they have in mind – turning something like a 200 × 200 pixel photo into a 1000 × 1000 pixel photo (just to pick arbitrary numbers). Of course, it’s not enough just to add pixels if the apparent image quality of your photo doesn’t improve along the way. Otherwise, why bother increasing resolution? Unfortunately, it’s not easy to get a good photo out of a low-res original – but it isn’t impossible. You still can get impressive results if you do things right, as shown below. Most major post-production software can increase the pixel count of an image. That’s not the hard part, though. The difficulty is in getting any meaningful detail along the way (or even the illusion of it). Hopefully, you won’t be surprised to hear that CSI-level “enhancing” of a low-resolution thumbnail is only possible on television. No matter how good your post-processing software is, you can only go so far to improve a low-resolution photo. Depending upon the software you use, sometimes the best-case scenario is making a pixelated image look out-of-focus instead! As nice as it would be, you simply won’t get something as detailed as the top image out of a low-res original. But that doesn’t mean the situation is hopeless. 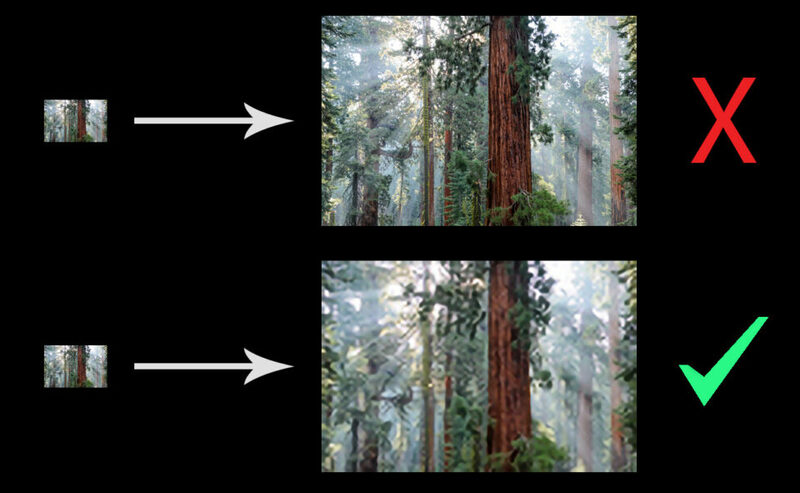 It still can help to increase the resolution of an image (meaning pixel count in this case) in post-production through a process known as upsampling. Personally, this is something I do when creating large prints – more than a meter/three feet across. It also helps as a last-ditch way to improve an image that otherwise could be unusable. If that sounds good enough for you, here’s what you need to know in order to increase resolution using some common post-production software. After you’re done, you may want to sharpen the photo slightly, although it depends upon the image. Overall, this is a very quick process. Personally, this is the method I use in order to upsample a photo for printing. To be specific, I’ll generally upsample the photo to get a 300 PPI image (pixels per inch) at my chosen print size, since anything greater than that is overkill. Many photographers already have Photoshop, and, not surprisingly, it’s the most popular tool for upsampling images. Still, you’ll find a number of dedicated options on the market specifically for this task. Historically, the best-known of these options was called Genuine Fractals. It eventually changed names to Perfect Resize, and now ON1 Resize, but it’s still the same program under the hood. Just because it’s standalone software doesn’t mean it’s the best, though. As you’ll see in the comparison section below, Photoshop CC’s “Preserve Details 2.0” algorithm beats out ON1 Resize convincingly. Still, if you don’t have Photoshop CC, some of these dedicated resizing programs may be worth checking out. If you do have CC, there’s not much of a reason to buy them today. Along with the many paid software options available, a few free tools can do the same thing. 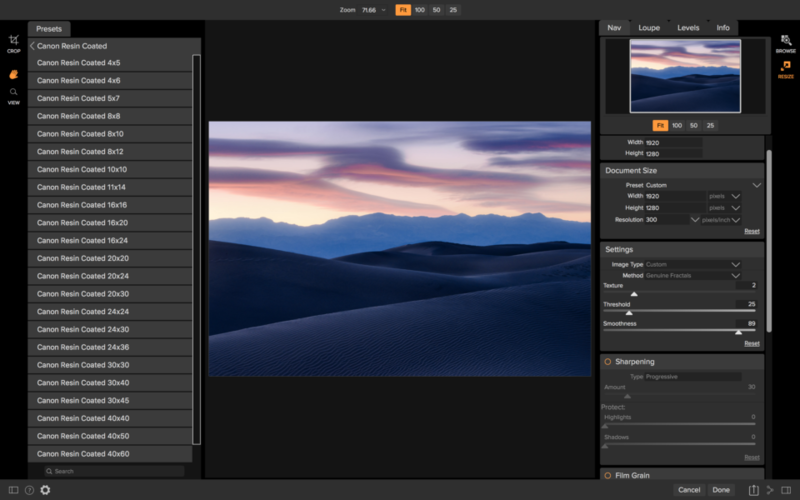 The open-source photography software known as GIMP is one of the most popular, not just for upsampling but for broader photography work as well. Upsampling in GIMP is a simple process akin to upsampling in Photoshop. Click Image > Scale Image and select your upsampling options, then consider sharpening the photo after the fact. Beyond GIMP, there are some websites which will upsample your images for free. Also, you may already own software with upsampling capabilities without even realizing it, such as Lightroom (which can upsample upon export). Before you pay for another product, it’s worth checking what you already own. Still, these technologies are not fully mature. Some of them are limited purpose algorithms, focusing only on a certain type of image, like people’s faces viewed from a certain angle. Others are more general, like Adobe’s, but not up to the same level as the specialized options. And since most of them aren’t yet available, it’s a bit of a non-issue anyway. Still, it will be exciting to keep an eye out for whatever developments may occur! I thought it would be useful to test some of today’s most popular upsampling software to see which options do the best job of increasing resolution. I wanted to test both a photograph and a digital illustration to see if there were any major differences. My method was to start with a 300 × 300 pixel version of each image, then upsample each to 900 × 900 pixels. Keep in mind that I only tested two images for this comparison, and you may find slightly different results with certain photos and illustrations of yours (or different amounts of upsampling). Still, this should give you a good idea of the relative strengths of each software package for increasing resolution. This is roughly what we’ve seen in the past with upsampling software. It doesn’t look great, but it’s better than pixelation. Adding some sharpening can help, so long as you do it after the upsampling step. This, on the other hand, is just outstanding. Photoshop CC’s experimental “Preserve Details 2.0” feature is so new that you need to enable a menu option in order to use it in the first place (Preferences > Technology Previews). It works well for both the photo and the illustration – not at the level of the original 900 × 900 pixel image, of course, but much closer than I would have expected. Note that you need to rasterize the layer before upsampling (by right clicking on the layer and selecting Rasterize Layer), or it won’t work. The image will resize, but not with the new algorithm. If you see a drastic difference between Photoshop’s upsampling preview and the actual final image with higher resolution, you’re doing something wrong. GIMP is a great Photoshop alternative, mainly because it’s free and surprisingly comprehensive. It works fine for resampling images, too, although it’s not at the top of the pack. GIMP’s landscape image is slightly better than Photoshop bicubic smoother’s attempt, but the illustration has more jagged edges. This isn’t a bad result by any means. With some sharpening, it is still respectable – certainly better than nothing when you make large prints. It does a good job making the landscape image look crisp, although part of that is due to built-in sharpening within the ON1 resampling options. Still, it picks up detail in the river that didn’t exist in Photoshop’s bicubic smoother algorithm, which is a good result. The same is true for the illustration. It’s slightly ahead of Photoshop’s bicubic smoother, although not by a tremendous amount (especially taking the somewhat more aggressive sharpening into account). On balance, ON1 Resize does a good job, but it is not at the level that I recommend paying $60 unless you know you need some of its more advanced options. 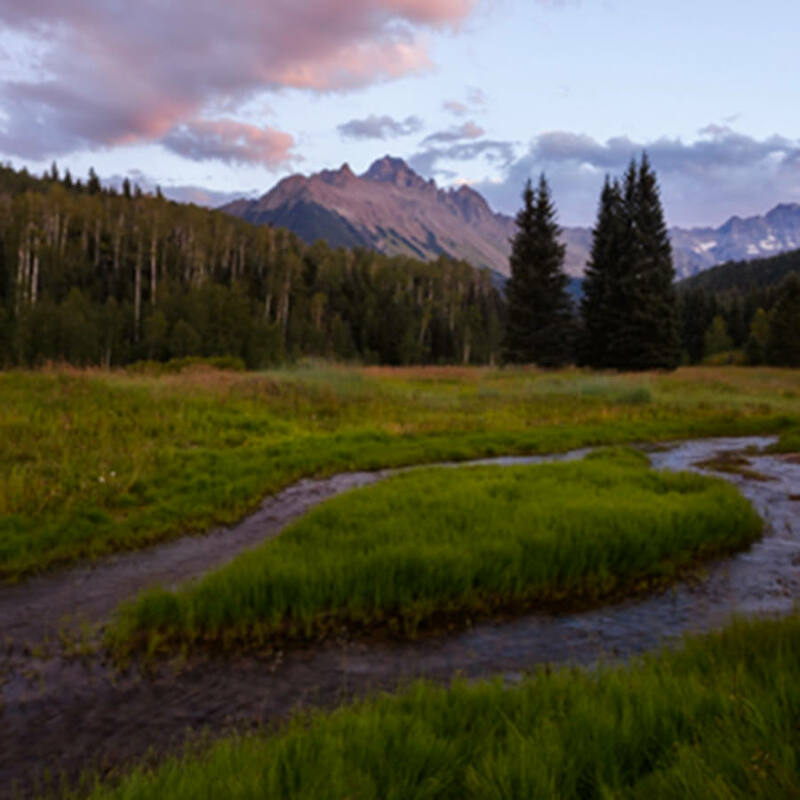 Specifically, the landscape photo has a decent amount of detail in the river and grass without looking over-sharpened. 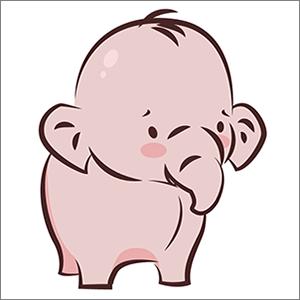 The elephant illustration looks quite good, too. Although it has some moderately noticeable jagged edges, it still looks better than almost all the other conversions (with only Photoshop’s “Preserve Details 2.0” winning out). That’s a great result for a website. To be frank, I went into this comparison expecting to see only minor differences between the different software options. 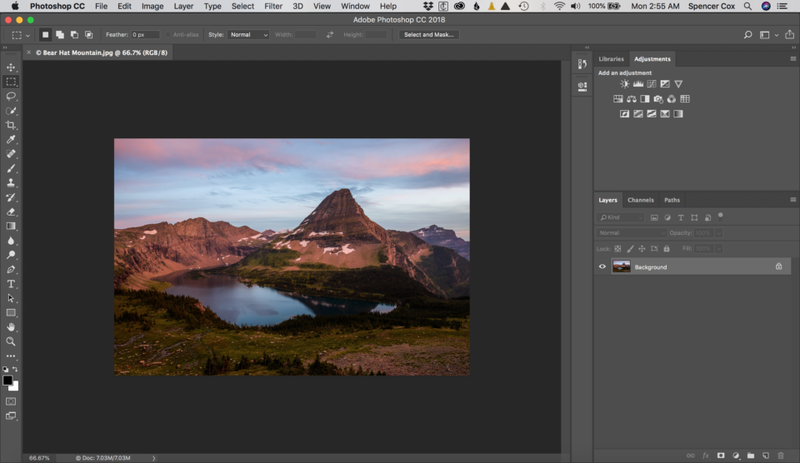 Instead, it turns out that Photoshop CC’s newest algorithm is very clearly better than the other options on the market, both for photography and for digital illustrations. I’ve made it clear before that I am not the biggest Adobe fan – in large part because they no longer sell standalone versions of their top software – but I absolutely have to give credit where credit is due. Whatever artificial intelligence juice they’re using in the “Preserve Details 2.0” algorithm clearly works well. It was interesting to see that the two lists are so similar, with only minor shuffling. Apparently, good upsampling software works well no matter what type of image you throw at it. One thing that surprised me was the quality of the free online option, Photo Enlarger, which punches above its weight in image quality – although it doesn’t have nearly as many advanced options as some of the other software here, since it’s designed for more day-to-day work. Only Photoshop’s “Preserve Details 2.0” was able to beat it both times, and that algorithm is just on another level. The comparison above demonstrates that all hope is not lost if your photos don’t have enough resolution. However, the best method (by far) for capturing higher-quality photos is to get as much as possible right in the field. Start with a sharp photo and crop as little as possible. That requires a few things. First, you need to start with good photographic technique if you want to get high-resolution images (going back to the original definition – the amount of detail in a photo). Use a tripod whenever possible, and make sure your shutter speed is fast enough to freeze any motion (from your subject or yourself, if shooting handheld). Lock focus properly on your subject, and don’t use too high of an ISO. In short, learn the proper techniques for taking sharp photos. However, if you want to take things another step further, that’s also possible. Personally, if I feel a wave of inspiration while I’m taking pictures, I sometimes try to capture an especially high-resolution image to print as large as possible. This can be done easily by taking a panorama (combining multiple photos together) instead of a single image – potentially increasing your pixel count several times over. There are other methods to increase the resolution of an image in the field as well. You can try focus stacking in order to increase your depth of field artificially (and use sharper apertures along the way). Other photographers will take multiple photos of the same scene – not panoramas – and average them in post-processing software to reduce noise and improve low-level detail. Quite simply, you have many options available. But even if you don’t use any special techniques like stitching panoramas or averaging several exposures, any camera today can capture high-resolution photos suitable for a large print. The upsampling techniques covered earlier are useful, but they’re mainly intended for salvaging especially low-res images or printing larger than normal. Hopefully, this article helped you learn how to increase the resolution of your images properly, with top image quality and minimal pixelation. You certainly don’t need to upsample every photo you capture, but it’s a good step to take before making large prints. And, if you ever have a very low-resolution photo that you need to enlarge to the point of usability, you now know how to get it to where you want. If you have any questions about resolution, upsampling, or post-processing techniques, feel free to leave a comment below! “Image resolution is the detail an image holds. The term applies to raster digital images, film images, and other types of images. Higher resolution means more image detail. Resolution is an actual measurement of physical size/ density, but it also includes resolving power, clarity and a number of other factors. 600DPI (dots per inch) is the resolution of the screen used to print many magazines use in four-color printing. But in all three of these examples, its not the only factor. For the Print example, what is the quality of the ink and paper-stock? for the Camera sensor, what lens are you putting in front of the sensor? Its one of those very complex concepts with a lot of variables that aren’t useful when trying to teach or explain something else. You are using it colloquially/conceptually to teach another concept, so it’s not an issue. The author overlooks one very effective resolution enhancing process: combining multiple images (not panorama) of the subject. Capture three or more images with the camera handheld of a single subject. Normal camera motion will capture slightly different details in each image. 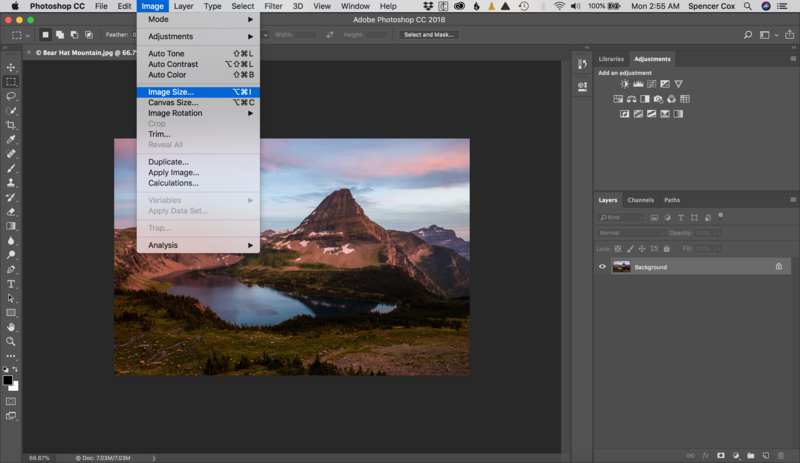 Then combine the images in Photoshop using the ‘auto-align’ feature. Upsizing the individual images before combining them improves the results. This also can greatly reduce noise in the image. There are several excellent tutorials online describing this method. Thanks for the input, Gordon – I added a note about combining several exposures together, as well as a mention of focus stacking. Although these aren’t methods I use very frequently, it is quite true that they can help. At the risk of stating the obvious, it could perhaps be pointed out that stacking or combining images is only applicable for static subjects. It doesn’t work at all well if the subject is walking, crawling, jumping, running or flying! ? How well does this technique work for small and shy subjects like birds, which are often very small in images even when powerful telephoto lenses are used? I’d suggest an additional open-source graphics package to test: G’MIC (gmic.eu/). It features a very good 2x upscaling algorithm that I find works much better than Lincoz or Cubic filters. The interesting part is that G’MIC can be installed as a simple GIMP plugin. Spencer, do you think you could send me your two tests images so I can test it on them? 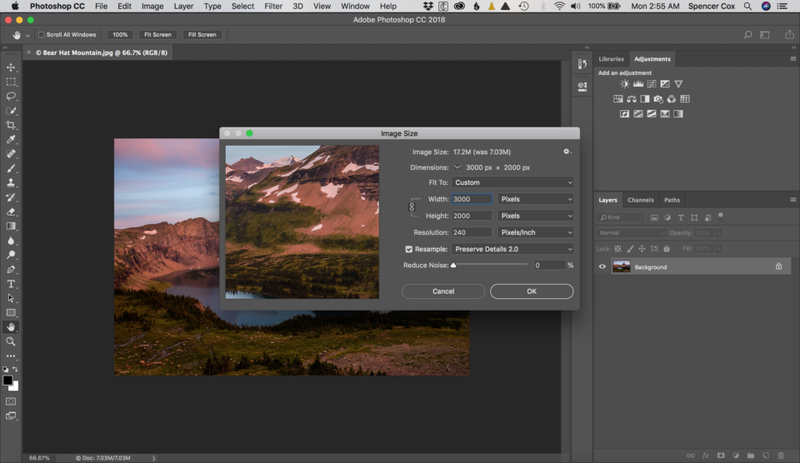 I’m very curious to see how it compares to Photoshop’s new algorithm. I’ll of course post the full size results on my flickr page. Glad you enjoyed the article, Florent! G’MIC sounds interesting. Is there a particular photo you would like me to send? The 300 x 300 pixel photos above are exactly the files I used for upsampling, and I don’t think they would have any additional compression because of the way I uploaded them. If you do this sort of comparison, feel free to post a link to your results. I think you are mistaken about the 300 x 300 photos you posted being identical to the ones you used for upsampling. In the landscape image, at the point where the top of the mountain meets the sky, the GIMP result you posted shows a bit of blurring but otherwise matches the original. I tried upsampling the posted 300 x 300 landscape using GIMP, and got very obvious JPEG ringing artifacts in that portion of the image. I would suggest that “resolution” is the amount of information in an image. With more information you can post-process nearly any image to whatever you want; you are merely transforming the information you have (a purely mathematical process that, thankfully, is going on under the hood). Without information there is nothing you can do about it. This is sort of an IT perspective, but a very useful one for conceptualizing what is going on, what you can do with it, and what you can’t. For instance, when you change pixels per inch you alter exactly one piece of information: the distance between pixels when printed. No other information is added, subtracted, or transformed. “Information” is, of course, a mushy concept. It includes pixels that can be distinguished from one another; for instance, blown out or blocked up areas contain no information. This shows that resolution (information) depends on factors other than pixel count. A picture of a gray card, if completely successful, contains only one piece of information — whatever 18% gray looks like for that camera. 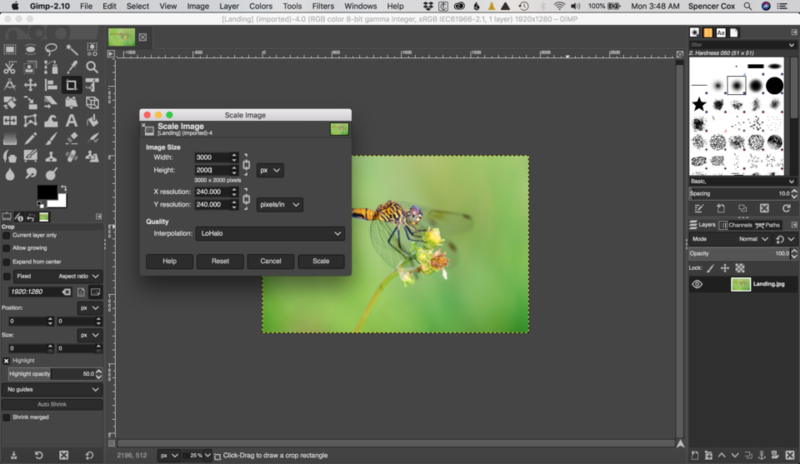 On Capture One software as Photo editing tool. I didn’t reference Capture One, that’s true, but these steps will be similar in most post-processing software (either in the main software or upon export). Best way to up your resolution out of the camera is to compose without needing to crop much in post processing. Interesting topic, Spencer – something I’ve never had to think about in my processing. You mentioned you use these techniques. I know you should shoot with some pretty high-res gear, so I’m wondering when it is that you’d need to do this considering a D800’s resolution is enough to provide prints 40×60 without upconversion. Is it for other cameras with less res or for significantly cropped images or even bigger prints? If it’s one of those reasons then I’m covered, otherwise I maybe missing an important step in my final processing step. Gordon – I think the intent of the article is to address the issue of working with a single exposure. But even if you combine multiple exposures, then try to increase the size of the merged image, you’ll still see a loss in quality. Merging photos will render more data (if shot in RAW) for improved dynamic range (recovering highlights and shadows) but won’t ultimately add additional detail that doesn’t suffer when the final image is enlarged. Phototshop and other softwares are physically adding pixels – in a number of different ways – but utlimately they’re “guessing” at what tones, content, etc. should be added to the photo, which is the source of the losss of sharpness. I’ve found the safest way to increase the overall size of an image in Photoshop is to increase it in as minimal way as possible. I would increase the number of both vertical and horizontal pixels, but drop the dpi. So if the photo is 10″ X 13″ @300dpi, then I would do something like this: change it to 12″ X 16″ (or whatever the exact equivalent would be dimension-wise) and drop the dpi to maybe 240. When printing, it wil hard to see the difference in quality iif done in this fashin. But, utlimately, there is no great way to double a photo size. There’s just too much loss in quality. I recently ordered some 10×15″ proofs from White Wall of “ultraHD Photo Print on Fuji Crystal DP II”. They supposedly optimize paper flatness and use a new exposure process that optimizes uniform distance of the lasers to the paper. They tell me that 400 dpi is ideal for this process, and I can attest to the resulting acute sharpness. I’ve been playing with the Lanczos 3 (non-separable) algorithm in Affinity Photo, and have found it works extremely well for 2x up-res digitized Kodachrome 25. A quick experiment from D750 images at 2x tells me that it gives fairly sharp output. I did have some halo around sharp edges though, and I suspected that there was an almost imperceptible sharpening halo in the original that got magnified and became noticeable. I repeated the experiment with very mild sharpening on the original and with the halo slider in Capture One to the max before export for Affinity Photo. Most of the halo was gone in the 2x version viewed at 100%, and I was very pleased with the result. A 2x up-res also magnifies noise which is then more difficult to remove. So, to sum up: It looks like you want to remove as much noise as possible in the original, and leave most sharpening to the 2x version. How come there is not a single comment on Lightroom´s resize abilities? I think the resampling algorithm in Lightroom is practically the same as in Photoshop, but I may be wrong? I did mention that you can resize an image in Lightroom upon export, although I didn’t go into it in detail. That algorithm is fine, akin to Photoshop’s bicubic smoother (not sure if it’s identical to that, but close). However, it is not the same as Photoshop’s Preserve Detail 2.0 algorithm that was so clearly better than any of the other options in this comparison. Every lens has a “Sweet F stop”. It is 3F from wide open. Spencer, FWIW I have become a huge fan of multiple image stitching as it allows me to carry a single lens rather than lug around a sack full and at 79 I certainly appreciate less weight. A 50mm on a full frame camera can cover a lot of ground and at the same time increase the resolution. As an example when using the 50 in the portrait position the angle of view is 27*. 3 images overlapped 50% will give the equivalent of 2 side-by-side for a total of 54* which is the same as a 35mm lens (the 2nd image serves to enhance stitching) 5 quick images at 50% overlap will result in a 3 wide image of 81* with better angular coverage than a 20mm. Add in a second row and your resulting image can be trimmed to an aspect ratio of 3:2 with a higher pixel count than a D850. Special added bonus, less distortion! Though the 50 is my usual choice an 85 is really cool for increased detail. I always enjoy your reports. You might want to take a look at Alien Skin’s Blowup-3. It is a new version. I have found it helpful and easy to use. I find piccure+ to be very good. It uses a different approach (image convolution). It is very slow and pricey, though. Does it make any difference if I upscale a photo stepwise (e.g. 4 times 10%) instead of upscaling in one step at 150%? Good question. While doing the research for this article, I did see that some people prefer stepwise upsampling rather than doing it all at once. I’m not quite sure why they do – perhaps that method was once preferable, or perhaps I am not implementing it properly, but I don’t see any improvements at all (in fact, I see the opposite). When I tested it out, I saw that Photoshop’s bicubic smoother algorithm was slightly better when done all at once rather than as steps. And there was a huge decrease in performance when doing the Preserve Details 2.0 algorithm in steps rather than all at once. So, I chose not to bring up this stepped technique in the article, since I don’t believe it is useful. But if you’ve been using this technique and have any suggestions on how to make it work better than the default algorithms, please let me know and I’ll test it out. I couldn’t find anyone online who listed a situation (or the necessary settings) with which stepped upsampling is preferable – and everything I tried gave a worse result. It is hard to exaggerate how truly above all the other options that new Photoshop algorithm is. This is one case where we can’t outsmart the algorithm by using our own methodology, whether fortunately or unfortunately. Anybody try the website called ” letsenhance.io” ? That was one of the websites I wanted to look at for this comparison, but there are so many different online options that I didn’t want to mess around with ones that required you to create an account (and that one apparently is only free for the first five images). If you want to test it, though, you can always download the 300 x 300 pixel files from this article and see how it compares to the ones I’ve posted. you are a much better photographer and photo-finisher than me. And, I read all of your article and have learned much from you. But, I have to disagree with your resizing method. To minimize the loss of detail and degradation, increase the size in increments of 110%. In the re-sizing menu change the width to 110 and value to Percent. Normally, PS will change the Height to the same amount and value. Change the other parameters as desired and hit OK. Look at the resized image. If you want to increase the size, repeat the process in 110% percent increments. From everything I have read, PS can not manufacture missing content or enhance weak content. PS does an excellent job. Nevertheless, you will lose quality as you repeatedly increase the size. Hi Prepalaw, thank you for your comment, and that is something I was wondering about as well (see my comment #16.1 to Rolf above). I tried the stepped method in Photoshop with both algorithms, old and new, and each time I found that going directly from 300 x 300 pixels to 900 x 900 pixels produced the better result. I have heard that other photographers like the stepped method as well, so you’re not alone there – I just don’t know what we are doing differently that I see clearly poorer results via that method, while others prefer it. If you have any light to shed, I would appreciate it! Since I already posted the Preserve Details 2.0 stepped vs unstepped comparison in a comment above, I’ll post the Bicubic Smoother stepped versus unstepped results here. They are more subtle, but the differences still favor the unstepped version. If you or anyone else can shed light on why we don’t have the same takeaway from the stepped method, I would appreciate it, and I’d be happy to run a few more tests! If anyone is still wondering why the upscaling in steps is inferior, the basic reason is that upscaling algorithms work on interpolation, and smarter algorithms have to make guesses about what’s in between pixels. What happens is that if you make a bunch of random guesses off other guesses (the result of stepwise scaling), the algorithm will make decisions based on already interpolated data, which might throw it off kilter as opposed to making one good decision off the original data. The example here would be the grass strands. In the small picture, you can see that they form sharply delineated lines. So, a smart algorithm would try and preserve that sharpness a little. Nevertheless, as you enlarge the image, some blurriness results. So if you enlarge stepwise, that blurriness will be incorporated into the new even larger image. If you just enlarge once, the algorithm will try its best to preserve sharpness. That applies mainly to smart algorithms. The “dumbest” linear interpolation ones won’t suffer much or at all from this effect. Why stick with a ‘belief’ when the evidence is staring you in the face? What might have been true for CS5 is long out of date. Does the up sampling have to be done from a raw file or can it be done from an older jpeg or tiff file. I have an older tiff file that was taken in portrait but we crop it to use in landscape. No need to say that this limits me in the usable size for printing. Could up sampling help in this case. David, that’s the ideal scenario to use upsampling! If you have Photoshop CC, I would stick to their new algorithm, which is far and away the method that retains the most detail. One of the best programs for upsizing an image is PhotoZoom Pro 7. Yes it costs money but for enlargements especially if you are doing door or wall size prints it is well worth the cost. Their algorithms are the best on the market and you can fine tune them. The artificial intelligence algorithm in Photoshop has won me over – I don’t think that traditional upsampling software is worth the money any longer, seeing how vastly lower in quality the other results were. 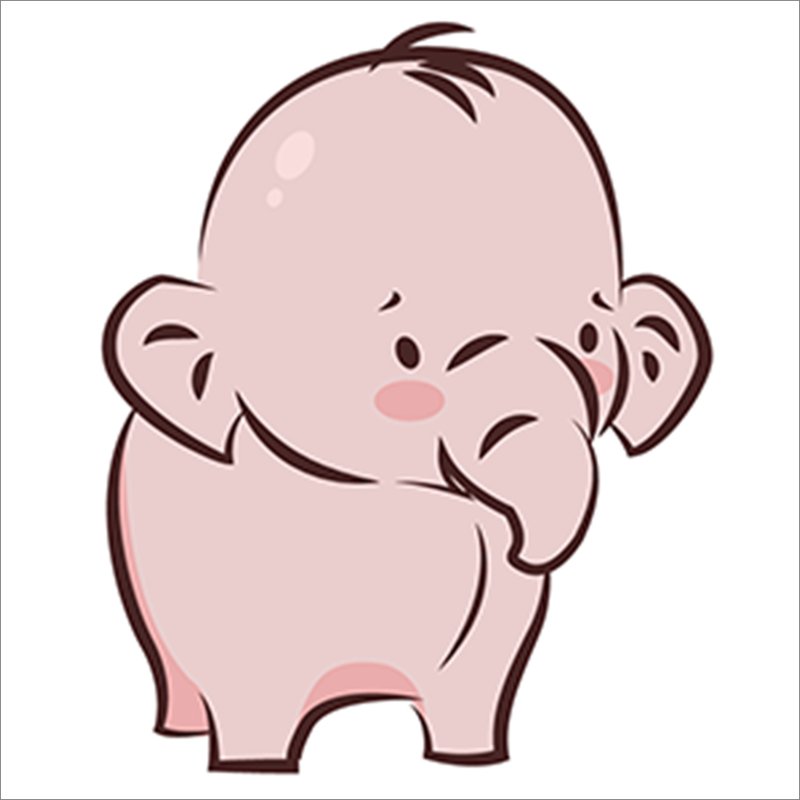 However, I have not tried PhotoZoom Pro, so thank you for the recommendation. Another fine, easy to grasp article–thank you! This reminded me of a related question: when might someone on the Photography Life team review On1Photo 2018? (It’s now at v. 2018.5.2.) You had been reviewing a number of processing softwares, and I thought initially On1PhotoRaw was on the list. But I haven’t seen any new processing reviews for a few months now. Spencer, thanks for ideas and comparison. 1.: outputting a 100% TIFF from Capture One 11 and upsampling that by Perfect Reize 7.5 in one step gave best results for me and the programs I own. 2: C1 has an option to output enlarged files up to 250%, but this was definitely not as good as the output of method #1. 3.: Enlarging in Photoshop CS5 gives somehow in-between results. Sorry for the old versions, but these are what I have and work with. I missed the PS CSS6 update and definitely dislike the currently used Adobe CC sales model, and didn’t yet feel the need to upgrade my ON Software. I only do update my C1 version regularily, as this is my favourite and mostly used tool. Thanks again for your articles and continue this fine work. I also found that resizing in Capture One gives inferior results to other software, in my case Affinity Photo. This is one of the few weaknesses I would like them to address. If they enhanced resizing in Capture One and added a robust in-fill brush, I would almost never have to leave Capture One for anything. Thank you for the original article and for the post. I actually do almost exactly what Hubert does – edit in Capture One Pro 11 -> export TIFF -> resize in Perfect Resize 9. Upsampling 300% from the original 16 megapixel Olympus OMD-EM 1 Mk1 produces great results. I might consider upgrading to ON1 Resize 2018 though. I tried up-sampling the 300×300 landscape image to 900×900 in Affinity Photo using the Lanczos 3 (non-separable) algorithm and got some nasty edge artifacts, and I wondered why since up-sampling 24 MP D750 images worked nicely. The D750 images were exported from RAW as 16 bit TIFF files. I looked more closely at the 300×300 image magnified so I could easily see the pixelation. There seems to be some crude edge artifact in that image, and I’m guessing that it was JPEG edge artifact. That could explain why this algorithm was giving bad results in the same way I got bad results with edge sharpening artifacts. I tried it with Lanczos 3 (separable) and that seemed to be a little less sensitive to this artifact noise. In summary of my two comments: Use RAW files and not JPEG files, never sharpen before up-sampling, suppress noise as much as possible before up-sampling, and if you have to export to do the up-sampling, always export as a 16 bit TIFF file (which is good advice in general anyway). Also, examining the original 300×300 images magnified, there is nothing in it that actually looks anything remotely like a solid line on top of the mountains; just blocks of grey blogs that barely suggests a line. So, Photoshop with the preserve details option is not actually preserving details at all: it’s creating detail, and the edge along the top of the mountain is an interpolation of some sort. I also see no evidence of the edge artifact noise I see in the original, so it’s also doing some sort of noise cleanup, which makes me worry that it could be cleaning up other things that you might not want to be cleaned up. I just noticed that PhotoZoom Pro 7 can be downloaded (for free) and used as a fully functional demo, leaving a watermark on the image. It’s bedtime here, and I might not be able to find the time to investigate this until late tomorrow at the earliest. Anyone else want to try it and report back? Especially compared to Photoshop and Affinity Photo. They seem to claim they can effectively deal with artifacts (especially the JPG variety) in the original. It’s those edge sharpening and JPG artifacts that I found trip up the Lanczos 3 algorithm in Affinity Photo, although that can be avoided by avoiding sharpening before enlarging, and using TIFF files converted from RAW. I bought ON1 Resize 2018 based on the results of this article. My thinking is I would get a bit better clarity than my CS6EE gives me using Bicubic Smoother. For starters, this product installs yet another VC++ runtime (2015) on the system. This is added to all other VC++ runtimes. Too much clutter. The current Dot-Net-Frameworks run on all Win7 and newer versions of Windows, without VC++ multiple runtime libs. Resize 2018 is not a true plug-in to Photoshop. It is a spawned EXE run from the File | Automate menu. On my very fast i7 cpu, 32gb RAM, Samsumg SSD, the code feels slow and fat. I find the user interface to be obtuse. Resize 2018 creates an Explorer context menu, for opening files from Explorer. My first attempt to open a 474×580 PNG crashed Resize with an infinite “not responding” window. This is lame. I sent a note to ON1 support. Last, on 72 dpi images, I can see no detectable improvement between Resize 2018 and CS6 Bicubic Smoother when increasing the size by 50%. I fully plan on keeping Resize 2018 on the system. Disappointed in spending $60+ for a system that changed from the 2017 version, and still has basic operational problems. One paid product I’ve been using is Tobaz Studio. I usually do basic editing in PS but if I want to add special effects to the image I’ll use Topaz. But Topaz has recently come out with a new upsampling software called A.I Gigapixel that is quite amazing. As well as adding detail it does a good job of controlling or removing noise in the image. At $99 it’s a little expensive but if you are doing a lot of upsampling and need sharp, detailed images this software will do the job. Many thanks for taking the time to research and write this article. I found it very helpful. enlarged 3 – 4 times at my exhibition. since the results are just incomparable from any other methods. You might wanna take a look in to it.